Another bike – the postman’s this time – and see the little sign that says “Accueil vélo”? It’s because it’s a B&B that is specially geared towards travelling cyclists. I was taking a photo of the bike with the sign when the postman came out of the building..
Encore un vélo – celui du facteur cette fois-ci. Vous voyez le petit panneau qui dit “Acceuil vélo” ? C’est parce qu’il s’agit d’une chambre d’hôte qui est prévue pour les cyclotouristes. J’étais en train de prendre la photo du vélo avec le petit panneau lorsque le facteur est sorti de l’immeuble. 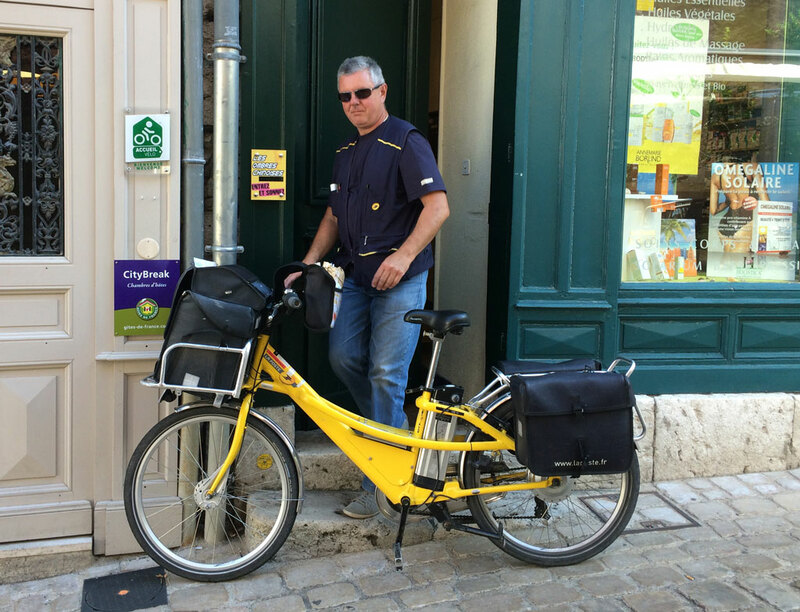 Posted in: Blois, City living, Cycling. I am surprised to see a postie still on a bicycle. In Paris, they are on foot, but in most other towns they use bikes or cars. Our postie comes by car because it would be too far to ride but when I lived in the suburbs of Paris, he had a bike. I thought they’d have motor scooters like here. Ah, OK. Perhaps they had them before the cars. I’m not sure. The cars are electric I think.